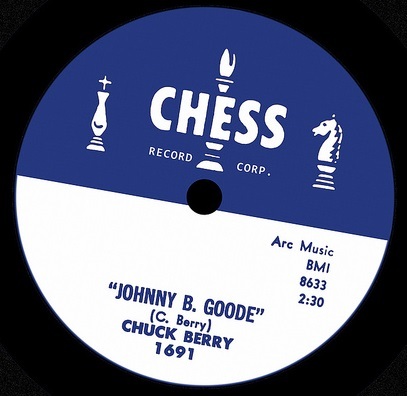 "Johnny B. Goode" is a 1958 rock and roll song written and originally performed by Chuck Berry. The song was a major hit among both black and white audiences peaking at #2 on Billboard magazine's Hot R&B Sides chart and #8 on the Billboard Hot 100. The song is one of Berry's most famous recordings, has been covered by many artists, and has received several honors and accolades. It is also considered to be one of the most recognizable songs in music history. The song is ranked as number seven on Rolling Stone‍ '​s list of "the 500 Greatest Songs of All Time"
Written by Berry in 1955, the song is about a poor country boy who plays a guitar "just like ringing a bell," and who might one day have his "name in lights." Berry has acknowledged that the song is partly autobiographical, and originally had "colored boy" in the lyrics, but he changed it to "country boy" to ensure radio play. As well as suggesting that the guitar player is good, the title hints at autobiographic elements because Berry was born at 2520 Goode Avenue in St. Louis. The song was initially inspired by Berry's piano player, Johnnie Johnson, though developed into a song mainly about Berry himself. Though Johnnie Johnson played on many other Chuck Berry songs, it was Lafayette Leake who played piano on this song. 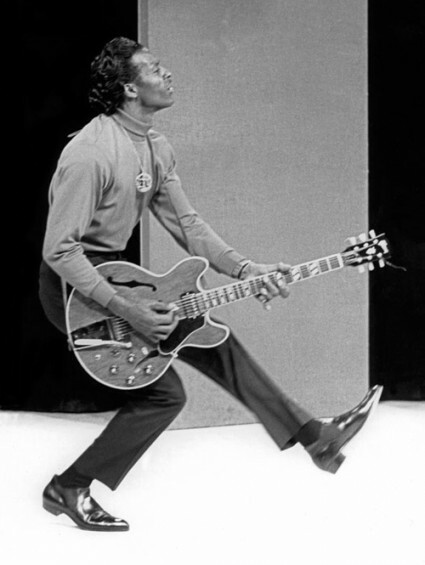 The opening guitar riff on "Johnny B. Goode" is essentially a note-for-note copy of the opening single-note solo on Louis Jordan's "Ain't That Just Like a Woman" (1946), played by guitarist Carl Hogan. Berry has written thirty more songs involving the character Johnny B. Goode, "Bye Bye Johnny", "Go Go Go", and "Johnny B. Blues"; and titled an album, and the nearly 19 min instrumental title track from it, as "Concerto in B. Goode".